Holy moly fall...you are already here! Wahoo! I have smelled "fall air" within the past three days. It may have just been a hint, but it was fall air none-the-less! Starbucks has begun serving the pumpkin spice latte. The temperature is starting to cool down. Leaves, your time will come soon to show your proof of this most blessed season! Over Labor Day Weekend, my family went back up to the lake house for one last summer hurrah! 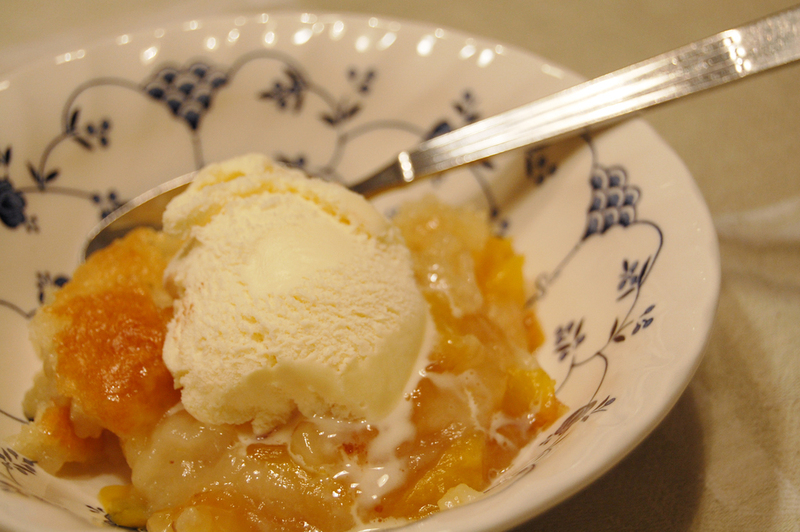 We're ending summer with a little peach cobbler! When I say that this is a peach cobbler recipe, I mean that it is a cobbler recipe in which you can add any fruit of your choosing. Blackberries, blueberries, raspberries, rhubarb peaches, the list goes on. What is even more crazy about this recipe is that it is legitimately fool-proof. I know that I have talked about a lot of recipes being easy. And most of them are. But this one...I think saying that it is easy would be making it seem harder than it actually is. It is the easiest dessert recipe that I have ever made. Ever. Make sure never to stir the ingredients after you pour them. This is a no stir recipe. Again, can it get much easier?! I think not. A very special thank you to our family friends Rick & Becky who introduced my family to this recipe. So great, easy, and delicious! Plus, so many different ways to make the recipe your own (ie. put in whatever fruit you like, or mix them!). Combine flour, 1 cup sugar (or less), baking powder, salt and milk. Melt butter in a deep pan and pour above batter into melted butter. DO NOT STIR! Pour fruit mixed with sugar into the pan. DO NOT STIR! Bake for about 60 minutes or until it is set.